Fat grafting to the breast has become an acceptable practice. It is being used to repair small defects as well as to augment. As I noted in my post (November 22, 2010), the two articles (2nd and 3rd references below) from researchers at the University of Pittsburgh School of Medicine suggests that it is NOT safe to use adipose-derived stem cells (ADSC) that may be part of fat grafting in any patient with active tumor cells. There are theoretical reasons why fat grafting might influence breast cancer growth or metastasis. Certain laboratory studies can be interpreted as supporting their negative impact on tumor development, metastasis, or recurrence. However, careful review of these concerns suggests that they arise from factors and situations that are not present to a significant extent in the clinical setting. A study that approximates more closely the clinical situation of fat grafting into the breast has been presented in poster form. This study investigated an orthotopic model of breast cancer in which human breast cancer cells were implanted into the mammary fat pad of immunodeficient animals, followed by placement of a human fat graft (with or without noncultured supplemental cells) immediately adjacent to the mammary fat pad containing the nascent tumor. The study found no increase in tumor growth with either an estrogen receptor-positive or an estrogen receptor-negative human breast cancer line. This is consistent with the absence of evidence for increased cancer risk in the many reports of fat grafting for breast reconstruction and augmentation. However, at this time, the number of patients with prolonged follow-up is only approximately 1000 and appropriate caution in proceeding is indicated. ……….In the clinical setting, several studies note the importance of good communication between the surgeon and an experienced radiologist to ensure accurate interpretation of breast imaging findings. Incorporation of these steps into good clinical practice and timely reporting of outcome data, including long-term follow-up—preferably in the form of multi-center clinical studies or a robust international patient registry—will ensure that the field develops in a safe and appropriate manner. 2. Regenerative Therapy and Cancer: In Vitro and In Vivo Studies of the Interaction Between Adipose-Derived Stem Cells and Breast Cancer Cells from Clinical Isolates; Ludovic Zimmerlin, Albert D. Donnenberg, J. Peter Rubin, Per Basse, Rodney J. Landreneau, Vera S. Donnenberg; Tissue Engineering Part A. September 2010, ahead of print. 3. Regenerative Therapy After Cancer: What Are the Risks? ; Vera S. Donnenberg, Ludovic Zimmerlin, Joseph Peter Rubin, Albert D. Donnenberg; Tissue Engineering Part B: Reviews. November 2010, ahead of print. This is a difficult post for me to write. As much as I admire the surgeons who are pushing this new advance I found myself bothered by this one. Why? That’s what I have been asking myself. After all, Linda Lu, 21 year old, is a college student from Orlando, Florida is ecstatic about the new hand. "I've already accepted it as my hand since the day I woke up," Linda Lu said during a Monday press conference at Emory University Hospital in Atlanta, where the surgery took place. "But just looking at it, sometimes I still can't believe that it's there... It kind of feels like magic." "I'm in information technology," Lu said. "So, my primary goal is to be able to type." Simple enough goal, isn’t it? When playing the “what would I give up game” my hands are never given up easily. I could probably learn to sew with only one hand, but it would be difficult and it would become mostly machine sewing. I could still blog as I could type with one hand – not as fast, but it would get done. I would not be able to do surgery with one hand, but a hand transplant would not give that back to me anyway. The dexterity would never be good enough. Linda is reported to have lost her left hand when she was 1 year old. The amputation was done due to complications from Kawasaki disease. Still I’m left with this uneasy feeling. Most people born with only one hand/arm adjust well. For example, look at the baseball pitcher Jim Abbott. This healthy young woman will now be placed on anti-rejection medications for life. It will make any pregnancies she has high-risk ones. She will be more susceptible to infections. Some anti-rejection medications increase the risk of cancers. Just because we can do a procedure doesn’t mean we always should. I hope my uneasiness regarding this one is misplaced. After all, I am getting my information from news articles and not from a discussion with the patient. Dr Mike Sevilla (formerly Dr. Anonymous), Family Medicine Rocks, is the host for this week’s of Grand Rounds! You can read this week’s edition here. I'm honored to be hosting Grand Rounds for the fourth time. This is not the GR theme today, but I did want to mention that it's Doctor's Day tomorrow in the United States. Doctor's Day was first observed on March 30, 1933. Eudora Brown Almond, wife of Dr. Charles Almond, decided to set aside a day to honor physicians. Dorothy suffered a second heart attack, leaving more of her heart muscle damaged and causing her to slip into congestive heart failure. There was not much we could do to reverse the many blockages in her arteries. Yet she was cheerful, as were her four children. One morning Mary came to find me. “Dorothy says she isn’t feeling well.” ……………. HT to @hrana for the link to this HuffPost article by Robert M. Tornambe, M.D: "What Is Beauty? A Plastic Surgeon's Perspective"
The word "beauty" is the most overused, misunderstood, poorly defined word in the English language. What makes a woman beautiful? The Holy Grail of beauty has never been completely understood. The cliché, "Beauty is in the eye of the beholder," is incorrect in my opinion. Perception is the key. It is "perception of beauty" that is in the eye of the beholder. Each of us, however, has a different perception of beauty. We all have different tastes, likes and dislikes, and this affects our definition and perception of beauty with regard to the American woman. As a plastic surgeon, it is my job to counsel people about this perception of beauty because so many misconceptions exist. ………. …. Rebecca Ghani investigates the long and sometimes bizarre tradition of self-experimenting doctors. Self experimentation throws up problems around practicality, accuracy, reliability, and ethics. ….. And why do this when there’s an agreed medical and ethical protocol for clinical trials? But delve a little deeper and ……. Should you be paid to part with a kidney? It's an unseemly question, but it's one that medical professionals have been grappling with as the waiting list for kidneys gets longer, supply of the organs stagnates and other solutions fall short. ……. Read on for two views on this topic. ……. …….How childless adults should approach their later years is a question that surfaces with some frequency among readers and commenters here. It’s true, as many attest, that being a parent doesn’t guarantee elder care. But it’s also true that the bulk of America’s old people are, in fact, cared for primarily by relatives: spouses first, then adult children. 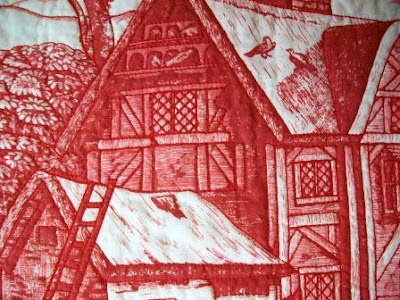 As anyone who has ever stitched, admired, or snuggled with a quilt knows, quilting has a history steeped in resourcefulness, storytelling, community, and warmth. 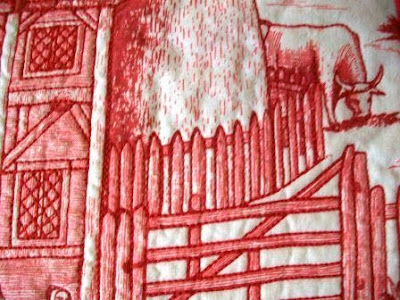 In honor of National Quilting Month, which marks its 20th anniversary this year, Amy Milne, the director of the Alliance for American Quilts, has penned a how-to project and a call for the importance of labeling quilts (and artworks of all kinds) for the sake of staking a spot in handmade history and taking pride and authorship in your craft. 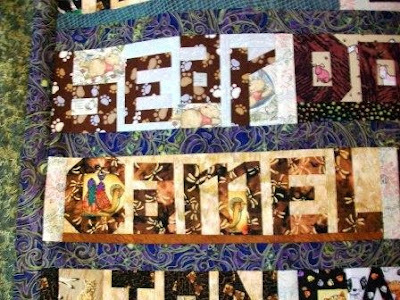 Do you have a quilt that holds a special spot in your heart or family history? Be sure to share your story in the comments below. ……….. I opted out of Medicare many years ago, so I could skip articles like the one referenced below. I don’t. ….If you pass the LCD/Article self-test, congratulate yourself for a job well done. If you do not pass the self-test, you should immediately take steps to become compliant. Let's start the self-test now. * Do you know how to find the LCD for Surgical Dressings and the Surgical Dressing Policy Article that is pertinent to the geography that you serve? If yes, have you printed both documents, read them, and shared them with your entire wound care team? If no, the Web sites in Table 1 will connect you with each of the DME MACs' LCDs and Articles. Remember that your wound care patients are counting on you to understand and implement a process that will meet all the LCD/Article guidelines. * Can you correctly answer these frequently asked questions? Q: Why do medical suppliers tell my patients with skin tears that Medicare does not cover the dressings that I order? A. Wound dressings are covered by Medicare when they are used on a surgical wound, partial-, or full-thickness skin wound, or partial- or full-thickness burn. Dressings are not covered for skin tears, abrasions, Stage I ulcers, first-degree burns, or cutaneous fistulas unrelated to a surgical procedure. I made this baby quilt for my friends who recently celebrated their 20th wedding anniversary. 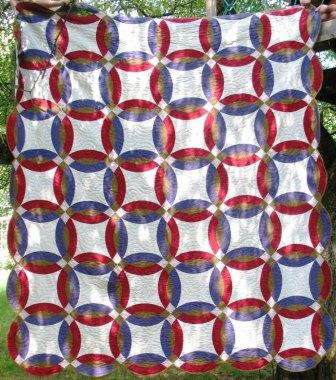 I had made a double wedding ring quilt quilt for them a year earlier. I used the red and green fabrics from that quilt for this one. Whole pineapple log cabin blocks make up the center. The border is meant to mirror those blocks. The quilt is machine pieced by me, but I had my friend Scottie Brooks do the hand quilting. It was finished in October 1998. My friend, Ben, took the photos for me. The quilt is approximately 44 in square. 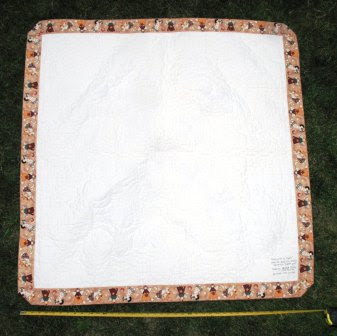 I named the quilt “surrounded by angels” due to the fabric I used as part of the back. 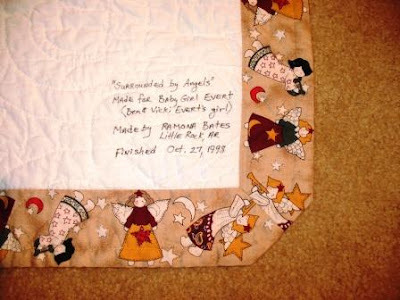 Here you can see the label and the angel fabric. To me that is clear. I was reminded recently that it isn’t to all patients. A patient complained of lack of relief from her pain medicines after surgery. Her description of the pain didn’t suggest any complications so I ask how she was taking them. I was looking for a way to safely use NSAIDS or tylenol as a boost rather than giving her something stronger. I prompted her to tell me when she took the next dose. I had mentioned to her and her caregiver that due to her small size she should begin with just one, then wait for 30 minutes to an hour to see if she needed the second one. They were doing that, but the other part wasn’t clear. 1. Take one pain pill every 4 hours. 2. Take two pain pills every 4 hours. 3. Take one pain pill every 6 hours. 4. Take two pain pills every 6 hours. 1. Take one and half pain pill every 4 hours. 2. Take one pain pill every 5 hours. So she was taking the medicine in a correct way, but it wasn’t the optimal one for her. We had a short discussion which seemed to help. There is much discussion about patients and compliance in taking medicine. It starts with the physicians, nurse, and pharmacists. I have to write good instructions. Sometimes this is difficult to do and keep them short enough to go on the label. With pain medicines it is nice for patients to know there is a range of effective, safe dosages. Updated 3/2017-- photos/videos and all links (except those to my own posts) removed as many are no longer active and it was easier than checking each one. It continues to amaze me that colleagues are able to do such marvelous work to improve the lives of some. For Dallas Wiens, 25, the benefits and hope of an improved life outweigh the risks of surgery and rejection (transplant). He is a construction worker from Ft. Worth, TX who suffered severe burns to his head two and a half years ago when the boom lift he was operating drifted into a nearby power line. The nearly fatal accident left him in a coma for three months. Better Health is the host for this week’s “Emotional Issue”of Grand Rounds! You can read this week’s edition here. Welcome to this week’s edition of Grand Rounds, the Cliff’s Notes of the medical blogosphere. Each week a different medblogger reads through peer submissions and summarizes/organizes them all into one blog post (using their own unique structure or theme). Instructions for participation (and hosting) are here. When I host Grand Rounds I like to organize the posts into emotion categories – kind of the way that movies are categorized into “drama, action, comedy, etc.” …... Judging from the volume of posts in each category, it seems that the majority of you are either surprised or outraged! It was beautiful sunny early Spring day, a Saturday as I recall. Trips were made to various stores to purchase items for school, then a last minute dash to the electronics store so I could pick up another charger for my cell phone. I ran ahead, my daughter and wife lagged behind, weary from the day's outing - at least so I thought ……. As I reflect of that experience ….., there was much to be learned from the experience of caring and offering compassion, one that mothers seem uniquely gifted at imparting to their children. Mothers are special that way. My mother showed me the importance of caring first-hand, never flinching even when the odds are stacked against you and your tiny aviary friend. ……………. Bongi is an amazing writer, and if you haven't, I strongly urge you to read his latest post, titled "The Graveyard." I imagine that a huge number of doctors know exactly what he means. I remember being told by a surgeon, while I was in medical school, that "you're not a real doctor until you've killed someone." I thought at the time (and still think) that there was a puerile bravado behind that admonition, but there is also a grain of truth. I have my own graveyard. Curiously, not all of its inhabitants are dead. They are the cases where I screwed up, or, charitably, cases that went bad where I feel that maybe I could've/should've done things differently. .…………..
And, yes, I have mine. I just haven’t managed to write about it. Ellen, a friend ……suggested a chart might help put different amounts of radiation into perspective, and so with her help, I put one together. She also made one of her own; it has fewer colors, but contains more information about what radiation exposure consists of and how it affects the body. ……I don’t include too much about the Fukushima reactor because the situation seems to be changing by the hour, but I hope the chart provides some helpful context. Note: If baby greens (with a 2- to 3-inch leaf) are not available, you may use larger greens (10- to 12-inch), but be sure to remove the tough center rib. Slice the leaves into 1/2-inch to 1-inch strips before cooking. ……….Of course, it never occurred to me that the screw heads could be painted, that the evenly-spaced pegboard holes could be the basis for pixels, and that screws driven to different depths could be used to create depth perception. And that's why Andrew Myers is an artist and I am just a blogger who writes about artists. ………. Physicians and surgeons all agree on the link between smoking and postoperative complications. We don’t agree (or know) how much time is required between cessation of smoking and surgery for optimal risk reduction. Dr.Thomas Fiala wrote a nice blog post, Smoking Cessation and surgical complications, recently discussing the 3rd reference article below. Smokers that quit smoking before surgery had 41% fewer complications. The researchers found that each week of cessation increases the effect by 19%. Trials of at least 4 weeks' smoking cessation had a significantly larger treatment effect than shorter trials (P = .04). Smokers that quit had lower rates of total complications, fewer wound healing complications, and fewer pulmonary complications. The first two articles referenced below were evaluated in an article written by Michael Smith for MedPage Today: Smokers Who Quit Preop Seem to Do Okay Postop. Those two articles looked at pulmonary complications not wound healing complications. There was also no significant benefit or harm when the analysis was restricted to the three studies with biochemical validation of quitting, the researchers reported. The relative risk was 0.57, with a 95% confidence interval from 0.16 to 2.01. Physicians should ideally try to get their patients to stop smoking several months prior to their surgery. The appropriate advice regarding the optimal timing of smoking cessation for patients seen close to their scheduled surgery awaits further research. 1. Stopping smoking shortly before surgery and postoperative complications: A systematic review and meta-analysis; Katie Myers; Peter Hajek; Charles Hinds; Hayden McRobbie; Arch Intern Med. 2011;0(2011):archinternmed.2011.97. 2. The optimal timing of smoking cessation before surgery; Clara K. Chow; P. J. Devereaux; Arch Intern Med. 2011;0(2011):archinternmed.2011.88. 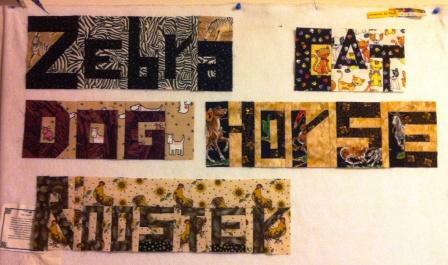 I previewed some of the word blocks for this quilt earlier. 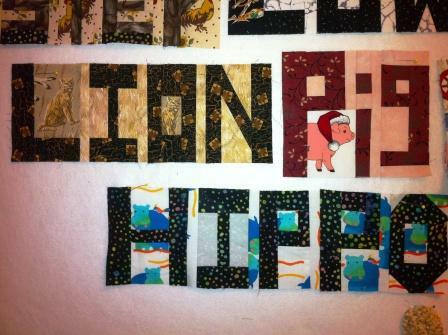 I have now completed the piecing. Here’s how the top looks. Now I have to do the quilting. Here you can see the bear and camel blocks. Updated 3/2017-- photos and all links (except those to my own posts) removed as many are no longer active and it was easier than checking each one. Monday I read with interest the Amednews.com article by Kevin O’Reilly: 1 in 3 Surrogate Decision-makers Carries Lasting Emotional Burden: a new study finds that advance directives ease stress when making treatment choices for others. "We had always thought about documenting your wishes and knowing what the patient wanted as a protection and a benefit for the patient," said Wendler, head of the Unit on Vulnerable Populations at the National Institutes of Health Clinical Center's Dept. of Bioethics. "This study suggests that there is an additional benefit as a protection for the family. Just leaving decisions up to the family may well be counterproductive and make it harder on the family, not easier." I and my siblings can attest to the lasting gift our mother gave us. There is a peace in knowing we followed her wishes when she had the massive intra-operative stroke which ended her life. She repeatedly over the years told us what she wanted and what she didn’t want. We are able to discuss it without feeling morbid. My husband is not. My dear husband finds it uncomfortable when I want to tell him what my wishes are when the time comes for tough choices. I tell my siblings and hope they will help him (and me) when the time comes. I don’t know what his wishes are. So if I have to make the choices for him, I may in reality be making the choices I would want made. Because it won’t be clear, there may be conflict between what his family (parents and siblings) would chose verse my choices. Many of us medical bloggers promote Engage With Grace (a movement aimed at having all of us understand and communicate our end-of-life wishes) over the Thanksgiving weekend. The Annuals of Internal Medical article (full reference below) reinforces the importance of this discussion between family members. I would go so far as to say the discussion should occur between friends as well. Having the discussion may become a lasting gift of peace you and I can give each other. 1. I would ask my sister (CD) to help my husband (BH) make care decisions for me when I can't. 2. If there is no chance of recovery from the illness, then simple make me comfortable. Do not do anything and everything. If there is no chance of recovery from a major trauma, then do what needs to be done to preserve the organs for donation. If the doctors don’t remember to ask, then tell them. Donate everything that is usable – this includes the face, the hands, bones, heart, liver, everything. As I wish to be cremated, it will be nice to know someone is helped. 3. I am not fond of pain, but hate the foggy headedness and nausea I get from the pain medicines I have taken. If possible find a compromise for me so I can be aware of visitors, listen to music and books, etc. 4. I want visitors who will tell me jokes and stories, who will read books (novels, adventure stories, mysteries, newspapers, etc) to me. If I am able, I will play cards and checkers with you. Bring the dogs along. Watch movies and TV with me. Cover me with a colorful quilt. 5. I want all of you to know I love you. Here are My Funeral Wishes. If we (BH and I) still live at the same house when my death does occur (hopefully years from now), then spread my ashes under the oak tree in back (the one with the wind chimes) where the ashes of Columbo, Ladybug, and Girlfriend reside. Systematic review: the effect on surrogates of making treatment decisions for others; Wendler D, Rid A.; Ann Intern Med. 2011 Mar 1;154(5):336-46. Earlier this week there was an article in the NY Times by Tara Parker-Pope --Forget the Treadmill. Get a Dog. -- which states in a more elegant way what I have been saying for years now. ……Several studies now show that dogs can be powerful motivators to get people moving. …..
Just last week, researchers from Michigan State University reported that among dog owners who took their pets for regular walks, 60 percent met federal criteria for regular moderate or vigorous exercise. ……. A study of 41,500 California residents also looked at walking among dog and cat owners as well as those who didn’t have pets. Dog owners were about 60 percent more likely to walk for leisure than people who owned a cat or no pet at all. …….. I have called my dog Rusty my personal trainer. He never lets me off the hook. We walk daily regardless of the weather (hot, cold, rain, snow). I also use a pedometer to remind me to get up and move more. It it a nice device to motivate me to not sit (& blog, read, knit, quilt) too much. “Five more minutes,” I tell him as he nimbly places his paws on my knees, brown eyes imploring. Orange ball cap on my head, gloved hands grab the leash. We exit the gate, the January sun cold as we jog toward the neighbors woods. Will there be ducks on the pond today? I was given the book In Stitches to review. The book is a memoir written by fellow blogger and plastic surgeon Anthony Youn, MD. Having lived through medical school and residency, I don’t tend to read memoirs of the experience, so it is not a book a would tend to gravitate towards. Having said that, I enjoyed reading it. Dr. Youn has an easy to read writing style. He tells his story with a lot of humor throw in. His Korean father, an ObGyn in Michigan decided his son would be “A doctor. Surgeon.” when his son is only 2 days old. Dr. Youn goes to medical school for his father, but along the way learns to love the discipline and maintain his humanity. You can read excerpt from In Stitches here. If you love memoirs, if you enjoy reading about the effort it takes to become a physician, if you enjoy good books; then you will enjoy this one. In addition to the book’s website, there is a Facebook page and a book trailer on youtube. Amy, Diabetes Mine, is the host for this week’s Grand Rounds! You can read this week’s edition here. The Ides of March is the first day of the Roman New Year. It also marks the first day of spring in the Roman calendar. On this day in history, Julius Caesar was warned by soothsayers to “beware of the Ides of March”. Apparently, he did not heed the warning strongly enough as he was stabbed by Marcus Brutus on the Ides of March in 44 BC. The lowest point in my residency was in January of my intern year. I was a Pediatrics resident back then, doing a month-long rotation on "Team 2," which is what we called the general inpatient pediatric team, with a focus on the patients on our liver transplant service. It was a very long month.…………..
or if you’d rather do so by texting: Donate to @SalvationArmyUS by texting "JAPAN" to "80888" or text "REDCROSS" to "90999"
Dangerous levels of radiation are leaking from the earthquake-crippled Fukushima Daiichi nuclear power plant north of Tokyo and levels are rising, Japanese Chief Cabinet Secretary Yukio Edano said Tuesday. Japanese Prime Minister Naoto Kan ordered everyone within 20 kilometers (about 12 miles) to evacuate. He told everyone within 30 kilometers (about 19 miles) to go inside. Japan's NHK television said most residents inside the 20-kilometer radius have already evacuated. …………. Just in case, Japan has distributed a whole bunch of potassium iodide to evacuation centers near the troubled Fukushima Daiichi and Fukushima Daini nuclear power plants. The International Atomic Energy Agency said in a statement that 230,000 units (the stuff comes in tablets and as a liquid) are at the ready. Why is that important? Well, one of the substances that can be released in a nuclear accident is radioactive iodine (I-131, if you're interested in the details). And some radioactive iodine has already been detected by Japanese authorities. ………. Surgery saves the lives of millions of people around the world, but only a tiny percentage of them live in low- and middle-income countries (LMICs), where a shortage of skills, supplies and infrastructure can turn easily treatable accidents and illnesses into lifelong disabilities and even death. The world's poorest receive only four percent of all major surgical operations worldwide, while 75 percent of surgeries benefit the richest third of the world, according to a 2010 Harvard University School of Public Health study. ……. Our medical blog friend, Dr Anonymous, has officially ended his old blog: Goodbye @doctoranonymous. He changed his twitter name last week: @drmikesevilla and has revealed his new website/blog: Family Medicine Rocks. Best wishes to you, Dr. Sevilla! You might expect your granny to knit you a woolly jumper, but one pensioner has been defying expectations by using her needles to craft amazing knitted BREASTS. Coral Charles-Dunne, 91, from Birmingham, has knitted dozens of the unusual educational tools as part of a project to inform expectant and new mums about breastfeeding. Browsing the news I stumbled across this March 2010 article on ScienceDaily -- Skin Transplant Offers New Hope to Vitiligo Patients. Though I know a little of vitiligo, I admit I had never heard of MKTP surgery. Interesting. MKTP (melanocyt-keratinocyte-transplantation) surgery is performed in Europe, Asia and Middle East, but not commonly in the United States. The article noted Henry Ford Hospital is the first to perform the procedure in the U.S. and are using the same technique developed by MKTP pioneer Sanjeev Mulekar, M.D., of the National Vitiligo Center in Saudi Arabia. MKTP involves harvesting melanocyte cells from an area of healthy skin and separating them to make a skin cell mixture. This mixture is then applied to the treatment area and covered with a specially developed adhesive biologic dressing. The procedure is done using local anesthesia. Treated areas included the hands, arms, legs, feet, face and stomach. The average size of the treated area during each procedure covered an area of 46 sq cm, or roughly the size of a credit card. Dr. Cris tells me I am no longer a novice at knitting socks. I still feel like a newbie though I am finding them easier and therefore more fun. I am surprised to find I have finished 7 pairs of socks. Here are three of those done since Christmas. This first pair I gave to my sister Jeanne. 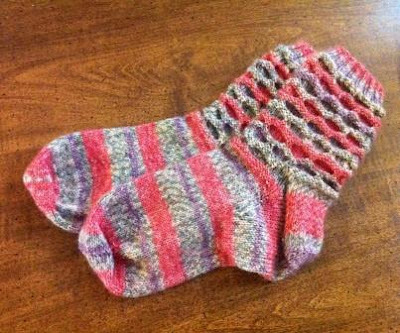 They were done using Sunrise Chevron Socks pattern by Carol J. Sulcoski . I really like that pattern and will use it again. The yarn is Patons Kroy Socks FX. This pair I gave to my mother-in-law. 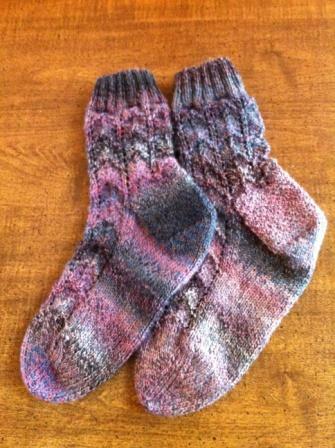 They were done using the Circle Socks pattern by Anne Campbell. They turned out pretty well. 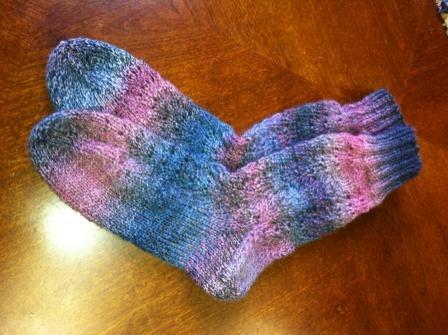 The yarn is Premier Yarns Serenity Sock Weight. 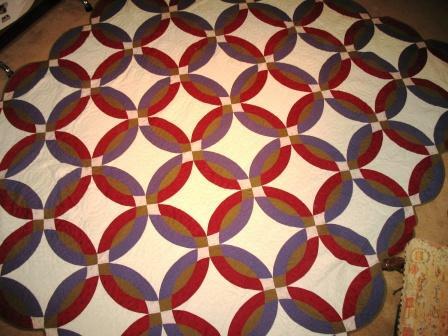 I made this quilt for the Alliance for American Quilts 2011 contest. I just made the deadline which was March 7, 2011. 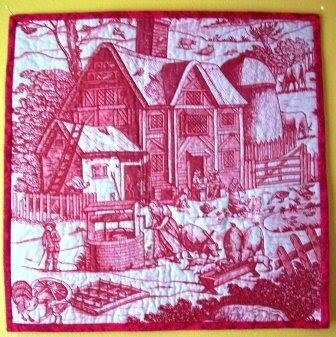 I almost didn’t make one this year as I was busy with the commissioned 1790 eagle quilt and then a few baby quilts. The theme this year is: “Alliances: People, Patterns, Passion,” a broad theme that celebrates cooperative relationships that work towards a common goal. 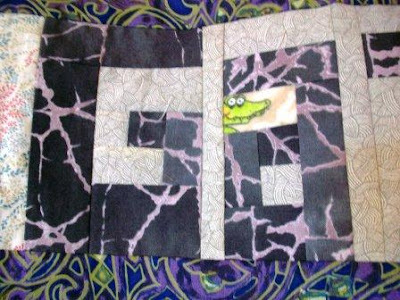 I knew I didn’t have time to piece and then quilt one. I remembered this fabric with the scene involving people working together so I decided to do a “whole cloth” quilt and machine quilt it. 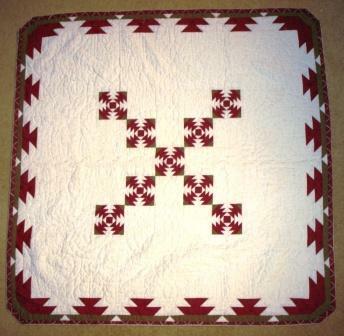 The quilt is 16 inches square. 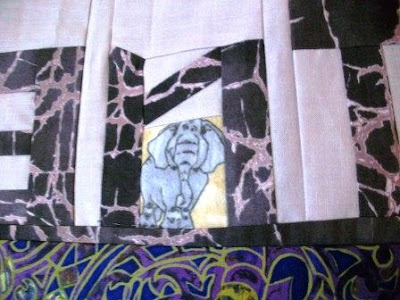 These next few photos are to try to show some of the quilting detail. I love these pigs. Not sure why one is wearing what looks like a yoke. I carefully worked around the fence slats and the window detail. 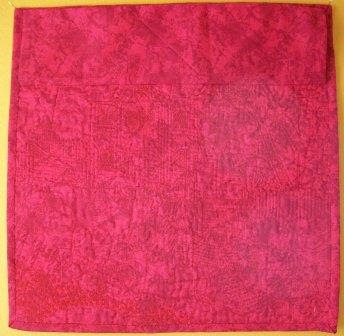 Here is the back after I added the 4 inch sleeve and before adding the label. The January issue of the Plastic & Reconstructive Surgery included a supplement: Current Concepts in Wound Healing: Update 2011. One of the articles (first reference below) discusses the economics of limb salvage in diabetes. An important topic. Consensus panels have recommended that optimal preventive foot care should include education of the patient and health care workers, therapeutic shoes and insoles, and regular foot care as part of a multispecialty program. …..In contrast, Ortegon et al. did not report results based on risk groups. These authors reported an improvement in quality-adjusted life-years and costs for all groups combined. The incremental cost-effectiveness ratio (1999 U.S. dollars) was $12,169 to $220,100 per quality-adjusted life-year gained, depending on the estimated effectiveness of ulcer prevention. The cost-effectiveness increased as the effectiveness of prevention increased. In the model of Ortegon et al., optimal foot care was only cost-effective if greater than 40 percent of foot ulcerations were prevented. The average cost of diabetic foot ulcer treatment ranges from $3609 to $27,721. ……. A small percentage of foot ulcers account for the majority of health care costs. For example, 9 to 20 percent of diabetic foot ulcers require hospitalization. The major cost in treating diabetic foot ulcers is inpatient care, accounting for 74 to 84 percent of total costs. Many of the studies that compare the cost of new technologies for diabetic foot ulcers are sponsored by industry ….. There are two bioengineered tissue products that are U.S. Food and Drug Administration approved. Dermagraft (Advanced BioHealing, Westport, Conn.) is tissue-engineered human dermis, and Apligraf (Organogenesis, Inc., Canton, Mass.) is a bilayered product of dermis and epidermis. Both products are designed for multiple applications. Therefore, the expense of therapy is increased because of repeat treatments, but the cost-effectiveness is enhanced by reductions in costly complications such as infections and amputations. ….. The projected average yearly costs for Dermagraft were 15 percent higher than treatment of patients with good wound care; however, the cost per healed diabetic foot ulcer was less than with good wound care ($77,703 versus $73,380 converted from euros using historical exchange rates for 2007). …..
Negative-pressure wound therapy ……….The average direct costs of patients who were treated for at least 8 weeks was $27,270 for patients treated with negative-pressure wound therapy and $36,096 for patients treated with good wound care. The biggest differences in the cost of care were attributable to hospitalization ($7823) and treating infections ($15,749). ………. …….It has been debated for years whether a primary amputation or revascularization procedure is more cost-effective. The rationale for early amputation assumes that the patients will be able to rehabilitate with a prosthetic and walk independently. For many patients, this is not true. Among unilateral amputees with vascular disease, successful rehabilitation is achieved in 47 to 66 percent of patients. Several studies suggest that the cost of revascularization is less than or similar to amputations when the costs of rehabilitation and prosthetic limbs are included. For instance, Raviola et al. and Mackey et al. reported that the cost of amputations was $24,700 and $26,142 and the cost of revascularization was $23,500 and $27,081 in 1985 and 1984 U.S. dollar values, respectively. Postoperative complications, revisions, and length of hospitalization are the primary expenses in revascularization. Raviola et al. reported that the average cost of uncomplicated revascularization was $20,300. The cost of graft revision was 41 percent higher ($28,700), and when bypass failed, the cost of amputation was $42,200. ………. Revascularization of the lower extremity entails two areas of treatment: endovascular interventions and open surgical revascularization. The cost effectiveness of these procedures involves the cost of the initial procedure, the need for revisions, and the long-term success of the procedures. Lombardi et al. found endovascular procedures to be safe and cost-effective when performed in an outpatient setting. This creates immediate cost savings over open procedures. The length of stay for open procedures ranges from 3.9 to 7.4 days. ……..
Revascularization of the foot through a pedal artery may not always be possible with endovascular techniques; thus, the cost comparison is not appropriate for many limb salvage patients with diabetes. More research is needed in this area, for several reasons. There are very few prospective data that evaluate the cost of limb preservation in patients with diabetes and lower extremity complications. Also, most of the data are based on models sponsored by the wound care industry, and much of this information is 10 years old or more. Finally, technological advances have changed what treatment costs and what we consider appropriate therapy. To understand the cost-effectiveness of limb salvage, the actual costs need to be evaluated as part of randomized clinical trials or prospective longitudinal studies that eliminate narrow inclusion criteria often seen in phase III clinical trials. In light of the recent new regarding the FDA safety alert on the possible association of acute large cell lymphoma (ALCL) with breast implants, the authors of the recently Plastic and Reconstructive Surgery Journal article (full reference below, published online ahead of print) conducted a systematic literature search on the topic. The search included the literature of PubMed, Embase, and Web of Science (Science Journals & Proceedings) databases. Dates searched included references from 1966 for PubMed and Embase ; from 1980 for Web of Science; and from 1990 for Web of Science Proceedings, through July 2010 for all of them. Research (categorized as epidemiologic studies or scientific papers) and non-research (case reports or case series) articles from peer-reviewed journals, conference abstracts, and unpublished manuscripts were retrieved from the literature search. Only human-based topics and articles written in English were considered. Of the initial 884 titles, 83 articles discussed ALCL and breast implants. Fourteen additional articles were provided by 2 expert plastic surgeons (V.L.Y. and K.C.C.). A form of ALCL, which clinically behaves more like the less-aggressive cutaneous form of ALK-negative ALCL rather than the more-aggressive systemic form, may be associated with breast implants. Future research on the epidemiology and biology of this rare disease is clearly needed to better understand its nature. ALCL is a rare disease, comprising 2% of all newly-diagnosed non-Hodgkin’s lymphomas (NHLs) worldwide2 and 0.9% of the estimated 65,540 cases of NHL diagnosed in the U.S. in 2010. 0.5% of all breast cancers and approximately 1-2% of all extranodal lymphomas. Despite the rarity of both ALCL and primary breast lymphomas, multiple cases of ALCL developing adjacent to breast implants have been reported, including by Brody et al., who have recently presented but not yet published a series of 34 cases. In 2009 alone, a reported 289,328 breast augmentation, 86,424 reconstruction, and 87,386 lift procedures were performed in the U.S.; unfortunately, the exact number of women who received implants is not known because only some breast reconstructions and lift procedures utilized implants. Fourteen (48%) of 29 ALCL cases were noted to have presented with a seroma, 1 (3%) ALCL case did not present as a seroma and data was not reported in the remaining 14 (48%) ALCL cases. Seven (24%) of the 29 ALCL cases reported data indicating that the patient had a palpable breast mass on presentation, 5 (17%) reported absence of a mass and information was missing for the remaining 17 (59%) ALCL cases. Duration of symptoms was rarely noted. In the 7 cases where it was, mean duration in years for ALCL cases was 0.8 (range 0.2-1.7). Mean symptom duration among 5 non-ALCL cases for which it was reported was 5.4 years (range 0.5-17). Both Allergan and J&J fund provide funds for ASPSS, as noted on its web site. At ASAPS, Allergan’s funding is more indirect. It has supplied research grants through ASAPS’ research arm, the Aesthetic Surgery Education and Research Foundation. You can see those grant award announcements by searching for “Allergan” here. The two groups ought to be ashamed of themselves. It is one thing to take funding from drug and device companies . . . . But the groups ought to represent the medical expertise of the healthcare providers who are their members, not the PR agendas of two companies who are afraid they may lose money from too much blunt but accurate talk about breast cancer. Dr. Pullen is the host for this week’s Grand Rounds! You can read this week’s edition here. This week for Grand Rounds I asked for submissions of the best work from blogger’s sites in the last week or two, and promised to judge them on Olympic scoring of 0-10. I also asked readers to submit posts from blogs other than their own (these have a *** after the score), and to agreed to give these submissions extra credit in the scoring. ……. Thanks for your submissions, and keep up the great work. Kim, Emergiblog, is the host of the latest edition of Change of Shift (Vol 5, No 17 & 18)! You can find the schedule and the COS archives at Emergiblog. Welcome to Change of Shift, the Double Edition! Between traveling and the ENA Leadership Conference, the last edition Change of Shift was, shall we say, delayed. That’s the bad news. The good news is I’m combining last week’s CoS edition with this week’s edition. Be sure to read to the end for an important notice about the future of Change of Shift. ……Achatz's cancer is now in remission. After his treatment ended, his ability to taste came back — but slowly. His perception of different flavor combinations — sweet, salty, bitter — came back one flavor at a time. "I started from zero, and the first thing back was sweet," he says. "So my palate developed just as a newborn — but I was 32 years old. So I could understand how flavors were coming back and how they synergized together. ... It was very educational for me. I don't recommend it, but I think it made me a better chef because now I really understand how flavor works." ………. Movin Meat has passed his donation goal of $15,000 for St. Baldrick’s, but if that doesn’t mean your donation wouldn’t be welcome. I made a small donation, but would love to make a larger one if someone would like to help me help Movin Meat and purchase this quilt. Send me an email if you’d like to purchase it, but would like the tax write-off. We’ll work out the details. A team from Arkansas Children’s Hospital led by Dr. Lisa Buckmiller is on a trip to Kenya. Their blog Change of Face – Bridging the Gap is chronically the trip. Over the past couple of months there have been a few good commentary articles on the use of CO2 laser us. The first one referenced below is a commentary by Dr. Scott J. Trimas on the treatment of facial acne scarring using CO2 laser abrasion. He references his article from 10 years ago (2nd reference). Full references are given to both articles below. Over a 10 year period, Dr. Trimas, did 54 additional patients not included in his first article (the 2nd reference below) using full-face CO2 laser treatment for facial acne scarring. Their ages ranged from 16 to 74 years. Of those patients reviewed, 8 were male and 46 were female. He notes this population was similar to that of the original study. Most patients were followed for up to 2 years. He also adds that one of the most substantial changes he has made is the addition of surgical excision of ice-pick scars prior to the laser resurfacing procedure. He performs the excision of the ice-pick scars at least 6 weeks prior to carbon dioxide laser abrasion. The rationale for this excision technique was that some of the areas of the face did not seem to improve enough with just resurfacing, and I felt that ice-pick scars may have been the contributing factor. In fact, most ice-pick scars that were punch excised were in the lateral cheek regions. That makes sense to me, as ice-picks scars are often too deep to be adequately treated by resurfacing procedures (laser or chemical peel) alone. The other recent article (third reference below) covers the use of CO2 laser for more than simply acne scarring. It was published in the February 2011 issue of the Plastic Surgery Practice. In the article, Dr. Joseph Niamtu III, discusses his use of the CO2 laser, giving practical tips – both the traditional ablative and the newer fractional lasers. If there is one drawback in employing traditional CO2 ablative laser resurfacing, it is the area of postlaser wound care. It adds extra layers of work (and sometimes frustration) for the patient, surgeon, and staff. If the process and experience of postlaser wound care could be ultimately simplified, the promoting of traditional CO2 treatments would be much easier. I know several experienced laser surgeons who have abandoned the procedure because of the intensity of the wound care and the hand-holding required to get the patient through it successfully. Inducing an intentional and controlled second-degree facial burn removes the entire epithelium and part of the dermis. This is obviously a giant insult to the normally intact integument. Patients who undergo fully ablative, high-fluence, high-density, multipass CO2 laser resurfacing have to understand in the preop period that this treatment will be their hobby for 4 to 6 weeks. I am very blunt with my patients who are considering this type of laser treatment, and I do not sugarcoat the recovery. Incidentally, for new practitioners, understating a recovery from laser treatment—or any procedure, for that matter—can really come back and bite you in the foot. In an era of new "miracle" treatments and surgeries emerging daily, some surgeons feel compelled to downplay the patient-recovery phase of treatment in hopes of "selling" a procedure. There is no better way to infuriate a patient then to tell them that a 2-week recovery is 1 week, etc. Not only does it upset them, it can cost them in other ways, such as missed work and other scheduled events, and disrupt family life in general. I tell my patients that they won't like me for a week, that they will need about 2 weeks before they can get back in makeup, and that they will be pink for several more weeks. If I tell them the recovery is 14 days and it takes only 10 days, I am a hero. If I tell the inverse, I am a zero. Understating a recovery is unethical and promotes negative marketing. I have seen too many instances in which a physician says 1 week for a 2-week recovery, then tries to squirm out of it by blaming the patient for "not healing well." I really appreciate how he is blunt with his patients regarding the recovery. Patients need to hear this along with the expected results and risks. 1. Facial Acne Scarring: Ten Years of Treatment With the Carbon Dioxide Laser (Commentary); Trimas SJ; Arch Facial Plast Surg Jan/Feb 2011 2011;13(1):62-64. You may recall the eye words quilt I made last year and the “Hope quilt” I did for Intueri to help her raise money for Multiple Sclerosis Society. I ventured into word quilts after finding Lazy Gal Quilting blog. Here is a close up of the “bug” part. 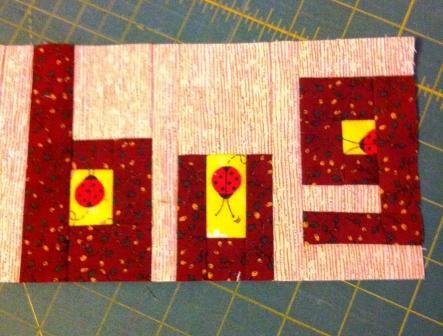 The activity spurred me to begin working on my next word play quilt which I have been thinking about since the eye words quilt. 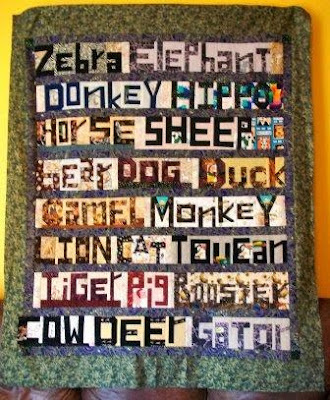 This one will be for my dog’s veterinarians (a husband and wife practice). 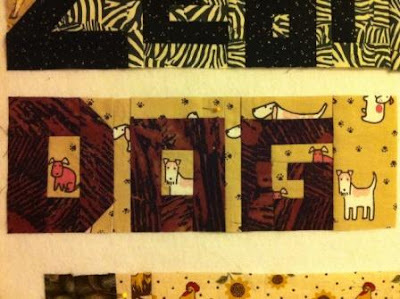 I meant for it to be composed of only domestic animals but lost to fabric in my stash. I really love the dog block. 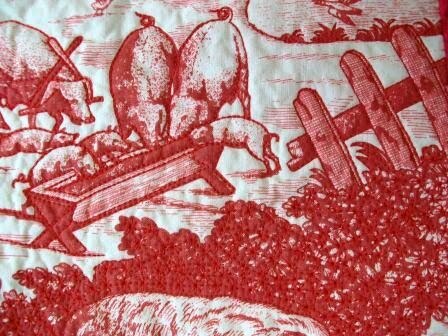 I have been surprised by the number of animals I have found in my fabrics. Anyway, this quilt is a work in progress. Not sure yet on which animals will make it in but enjoying the work/play. I made this queen sized double wedding ring quilt for some good friends. The quilt was meant to be a swap. I was to make a quilt. She was to make a wool rug for me. I never got my rug as she broke her wrist and then got side-tracked by their first baby. Oh, well, I still love them both. 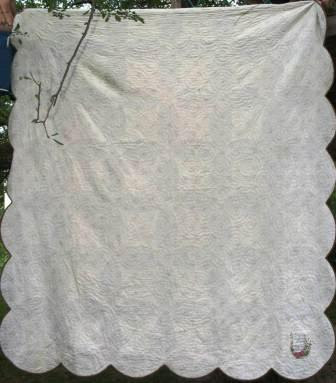 I hand pieced this quilt, then had my friend Scottie Brooks do the hand quilting. It was finished in 1997. I am thankful to my friend for taking these photos for me. The colors are red, green, purple, and cream. Here is a photo of the back. Earlier this week there was an article in my local newspaper (subscription only for full access) on a family physician in Bono, Arkansas who takes chickens as payment: Bartering for Care – House calls’ a trade-off. In lieu of payment, patients at the Bono Barter Clinic can exchange a variety of things such as produce or labor for medical services on Thursdays. House devotes the other four days of the workweek to his regular family practice - the House Medical Clinic - both practices in a former church along U.S. 63 between Bono and Jonesboro. Of note is that this is 20% or less of his workweek, as the bartering only takes place on Thursdays. As we all know, our utilities don’t allow us to pay via bartering. Neither do the medical supply companies we purchase syringes, needles, drugs (ie lidocaine, vaccines, etc), and bandages from. Still I do commend Dr. John House. He is strict about certain rules which is also important to note. The barter clinic won’t submit a bill to your insurance if you happen to have coverage. Nor will they prescribe narcotics. An amednews story from Jan 12, 2009 noted: Trading for treatment: Bartering makes a comeback. The article discusses the rules of bartering which will keep the IRS happy and makes suggestions to make bartering work for your practice. Have a willing business partner. Find the right trade partner. Keep your percentage of barter patients low. Have an agreement in writing. Make sure values are equal on both sides of the trade. And now, a story about the effects of war and violence in a different part of the world and how specialists are learning from it. The wars in Iraq and Afghanistan have created a need for innovative treatments for severe battle wounds. Service members often suffer injuries that disfigure and even eliminate parts of their face. At a Defense Department clinic in Texas, surgeons are restoring missing facial features and in a way they're restoring the identities of the wounded. He's now working with doctors at the Maxillofacial Prosthetic Clinic at Wilford Hall Medical Center. Today his anaplastologist, Nancy Hanson, is fitting him with a new set of ears. ………….. The maxillofacial prosthetics program is only one of two such programs in the Defense Department, said Col. (Dr.) Alan Sutton, the program’s director. The other program is at the National Naval Medical Center in Bethesda, Md., he said. ………Often most important to the patient is the restoration of function – speech, chewing and swallowing — in cases where injury or cancer to the mouth or jaws has occurred. The team’s first step frequently starts in the stereolithography lab, located at MacKown Dental Clinic, which is one of only two located in the DoD. Stereolithography is a rapid prototyping method, which allows the fabrication of anatomically accurate, three-dimensional epoxy and acrylic resin models from various types of medical data. There are myriads of data formats that can be assimilated, some of which include those from computed tomography, magnetic resonance imaging, and optical scanners. The team’s anaplastologist then works to create facial prosthetics for the patient. Anaplastology is the art and science of restoring a malformed or absent part of the human body through artificial means. Again, Lackland is unique in that MacKown Dental Clinic employs the only certified clinical anaplastologist in the DoD, Ms. Nancy Hansen. A keloid scar is the result of an abnormal proliferation of scar tissue that forms at the site of an injury to the skin (eg, on the site of a surgical incision or trauma). Keloid scars do not regress. They grow beyond the original margins of the scar which differs from hypertrophic scars which while raised do not grow beyond the boundaries of the original wound. Hypertrophic scars may reduce over time. Keloid scars tend to recur after excision so anything that can help me prevent their formation is welcome. I stumbled across this press release a few weeks ago. It explains the findings published in the article (first reference below) published online January 21, 2011in the British Journal of Dermatology which notes a possible molecular target in the prevention of keloid scarring. Collagen triple helix repeat containing-1 protein (CTHRC1) inhibits the transforming growth factor (TGF)-β1-stimulated collagen production that occurs in keloid scar formation, report researchers. "Keloids are manifestations of an abnormal process of tissue repair after trauma to the skin. Options for treatment are limited because of lack of understanding of the molecular and cellular mechanisms governing the formation," explain Hongxiang Chen (Huazhong University of Science and Technology, Wuhan, China) and colleagues. "Increased understanding of the role of TGF-β signaling in keloids makes manipulation of TGF-β an attractive therapeutic strategy," they say. CTHRC1 is expressed in the adventitia and neointima on arterial injury. Chen and team assessed regulation of the CTHRC1 gene, its interaction with TGF-β1, and its possible role in keloid scar formation in fibroblast cells from keloid tissue and normal skin. TGF-β1 and CTHRC1 were localized to the dermis in both normal and keloid skin fibroblasts. Expression of both factors were increased in keloid compared with normal skin and CTHRC1 appeared to increase in a TGF-β1 concentration-dependent manner. When keloid fibroblasts were treated with TGF-β1 (10 ng/ml), cell proliferation increased dramatically, specifically, collagen type I synthesis was preferentially stimulated. However, when recombinant CTHRC1 was added to the TGF-β1-treated keloid cells, the proliferation effect was reversed and excess collagen synthesis was inhibited. Notably, treatment with recombinant CTHRC1 appeared to have no adverse effects on cell viability. "Our data indicated that TGF-β1 was overexpressed in keloid fibroblasts and recombinant CTHRC1 could reverse TGF-β1-induced collagen type I expression at least in part by decreasing collagen synthesis," conclude the authors. "As a potent negative regulator of collagen matrix deposition, CTHRC1 may have therapeutic value in antifibrotic treatment strategies," they suggest. It would be nice if someday this research lead to a “prevention” therapy.